In my recent plein-air post I mentioned that I hoped to do some more paintings of my hometown. During the recent few days of beautiful weather, the time felt right to tackle this view of Brighton seafront. 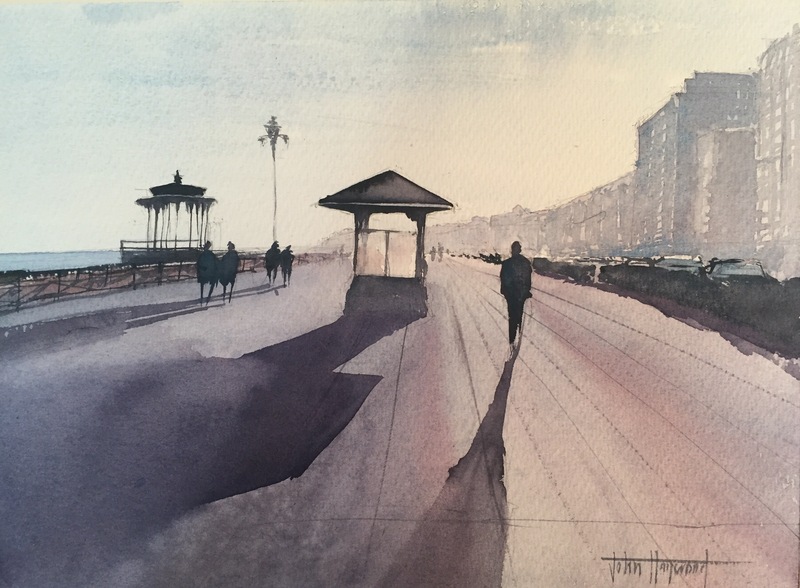 It was based on some photographs that I took recently during a wonderful evening’s walk along the seafront, when the sun was setting low on on the horizon and casting the the most brilliant shadows. It was so bright that I couldn’t really see what I was photographing so it was a little hit and miss but I managed to get quite a good series of contre-jour images. Whilst I think this painting is effective, and is perhaps evocative of Brighton seafront at sundown, it doesn’t really move me. There are elements of it that I like, particularly the handling of the buildings as they move from the foreground into the distance. I also like the sense of light coming through the windows of the shelter too. I’m pleased to have tackled this, and may yet do another painting or two from the same series of images, but I think I need to spend some more time exploring my hometown with a painter’s eye! ← Watercolour coaching – just do it!